Beautiful strawberries from Gillespie Farms in Gray. Before class gets started, Paula reads the children a book called The Cow Loves Cookies by Karma Wilson. 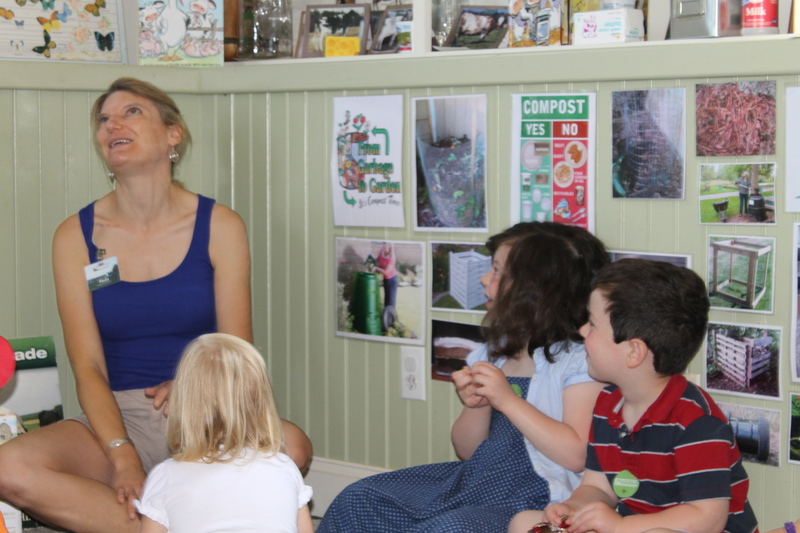 The kids in class are smitten with the story, which details all of the expected things farm animals enjoy eating, like corn and hay. But the cow? She loves cookies (much like her audience). After the story, Paula talks about the ingredients we’ll use to make ice cream—many of them sourced locally. The whole milk comes from Pineland’s Holstein cows, the fresh strawberries from Gillespie Farms in New Gloucester, and the cookies are made onsite at the Market bakery. Paula discusses where heavy cream comes from, and passes a carton from Hood around the room. She shows the class a vanilla bean, and lets the children pass it around the circle. “The smell of vanilla always reminds me of home,” Paula says. Paula having fun with the Cute Potato kids. She invites the kids to gather around a table where most of the ingredients are pre-measured in Mason jars. 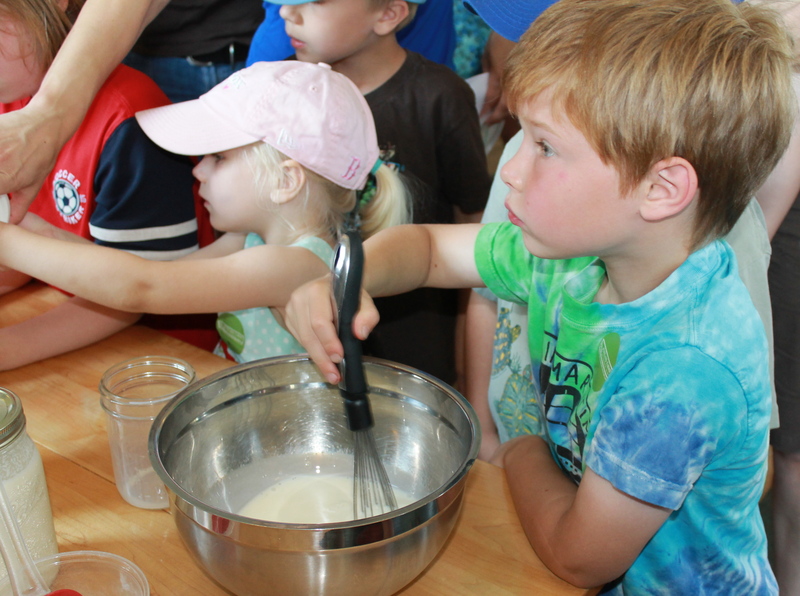 The children divide into three groups and take turns adding and mixing the milk, sugar, cream, and vanilla. 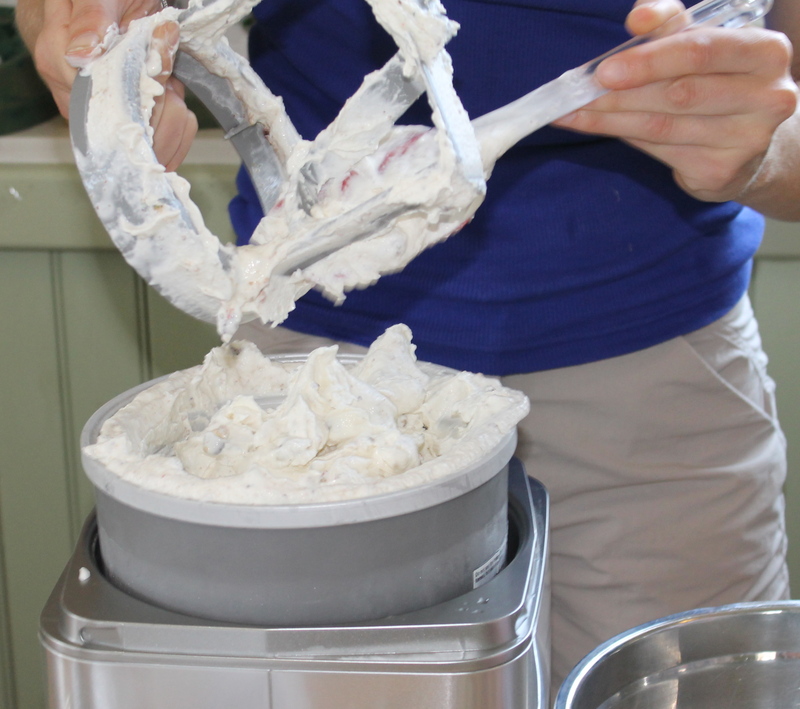 When the prep work is complete, two of the mixes are poured into Cuisinart ice cream makers. A young boy stirs and listens intently as Paula walks the kids through the recipe. Paula saves the plain vanilla mix for an ice cream game. In a large, lidded plastic container she mixes rock salt and ice. She places the vanilla mix into a smaller lidded container and puts it on top of the ice. She seals both lids and invites the kids outside to play. Paula shows the class how to make ice cream without a machine. The children gather in a circle on the lawn. Paula tells them to roll the white container to each other and announce their favorite ice cream flavors when they do. The kids love this activity. 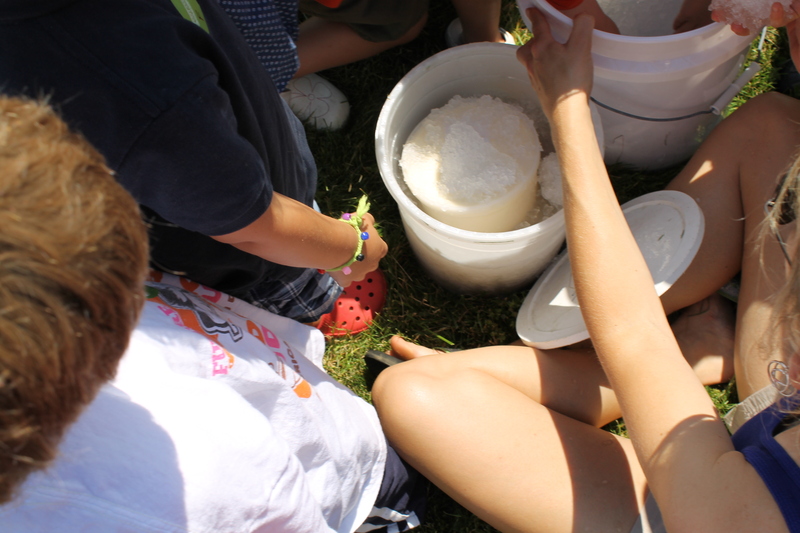 There’s nothing like playing a game and simultaneously making vanilla ice cream on a hot June day. 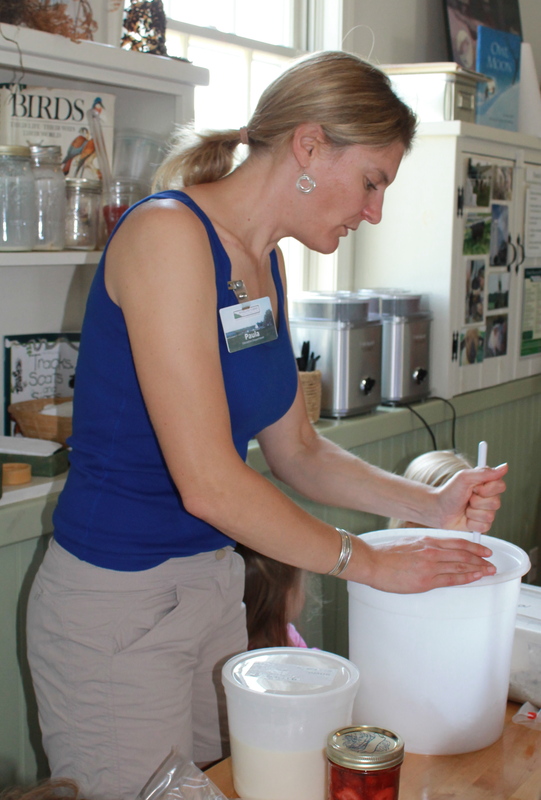 Pineland’s gorgeous pastoral setting is the perfect place to make ice cream. After 25 minutes of play, Paula checks inside the canister to see if the ice cream is done. She thinks the mix still looks a little soft, so we bring the canister back inside to roll it around on the wooden floor. The vanilla ice cream is making progress in the canister. The M&M cookie batch is the first to be complete. We all wait patiently while Paula serves this flavor. And oh, this ice cream is heaven. MP is amazed by how creamy and fresh it tastes. She makes a note to buy herself an ice cream maker soon. Paula reveals the M&M cookie ice cream made in the Cuisinart. The other batches are just as good. 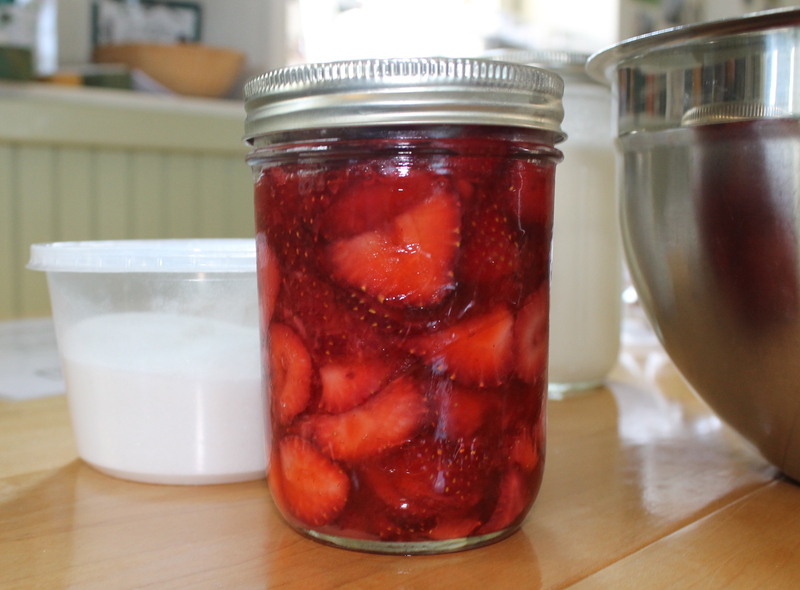 The strawberry has the consistency of a smoothie, but tastes as sweet as the fresh strawberries used to make it. The vanilla from the container comes out more like traditional hard serve. Everyone in the room is smiling and saying, Mmmm, between bites of ice cream. 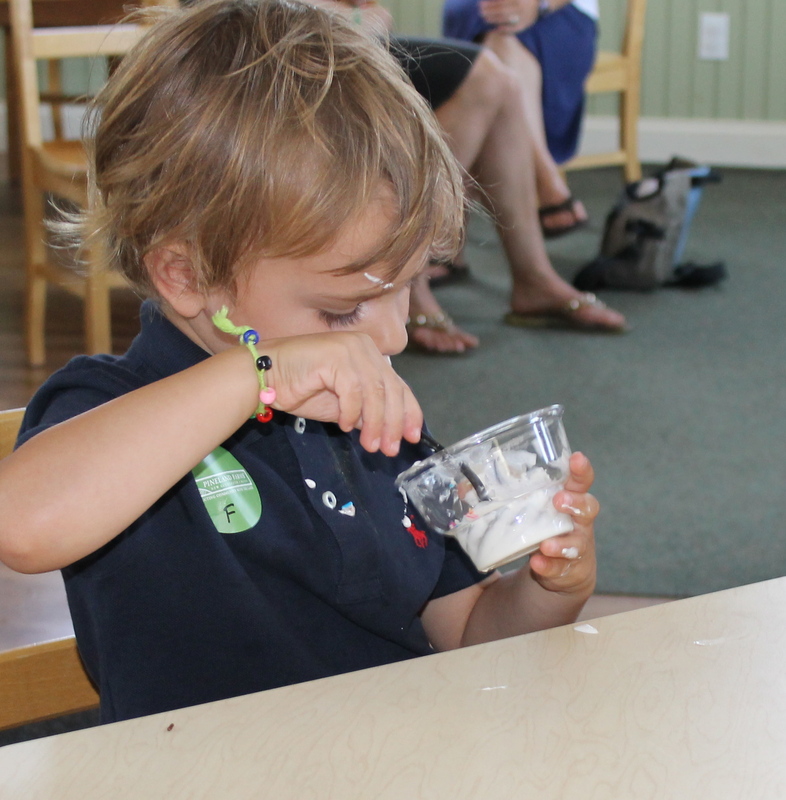 One young participant enjoys the results of a morning of ice cream making. 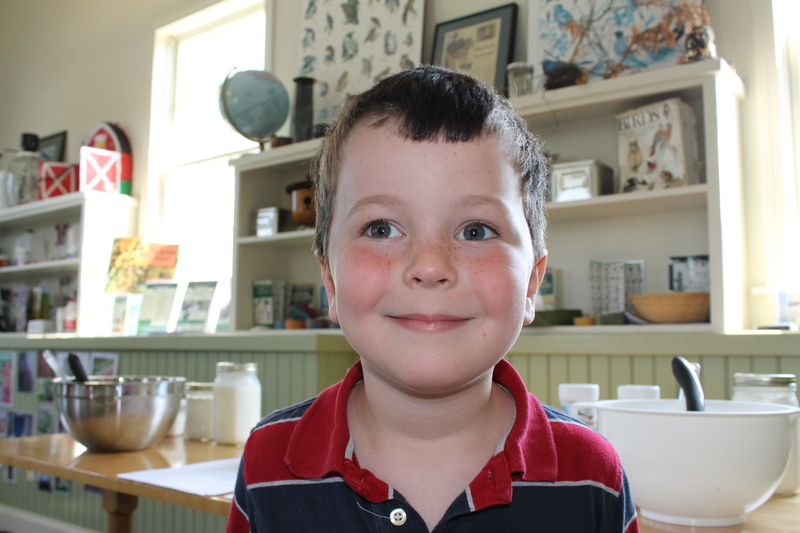 To learn more about Pineland’s Summer Education Programs and how your family can participate, visit here.